Waylon Jennings: An Outlaw Opens Up Musically In 1996, country star Waylon Jennings, who helped found the "outlaw country" movement, joined Terry Gross for a discussion of his music, his work with Willie Nelson and Buddy Holly, and his time spent working in Nashville in the 1970s. 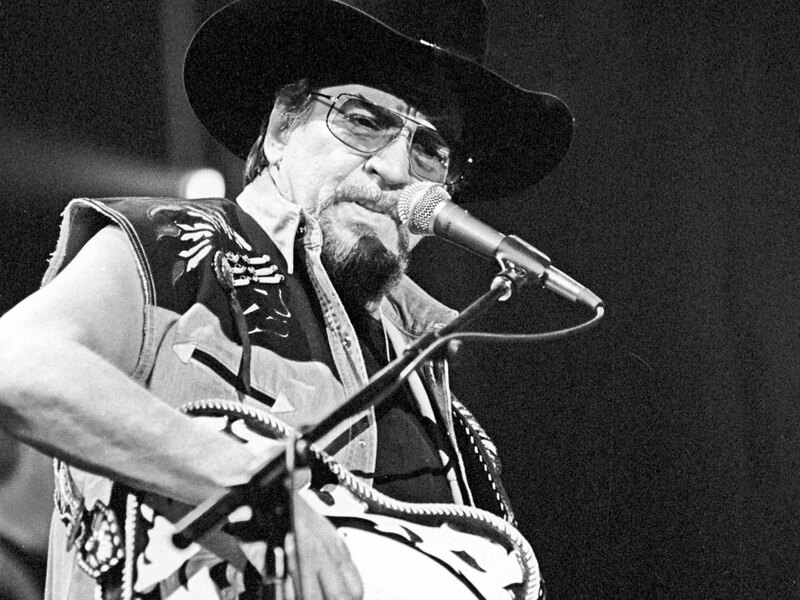 Waylon Jennings performs live in Nashville on Jan. 5, 2000. The singer died in 2002. In the mid-1970s, country music star Waylon Jennings made records with a stripped-down production style and a rock rhythm. It was an outlaw movement, and it changed the direction of country music. Jennings, who started his career as a disc jockey, grew up in Littlefield, Texas, and started playing in a band when he was 12. His group made frequent appearances on KDAV, a local country radio station, particularly its "Sunday Party" program. It was there that he met Buddy Holly in 1955. "Local acts got to come in and sing, and Buddy was one of the regulars. I was from another town, about 40 miles away," Jennings told Fresh Air host Terry Gross in 1996. "But that's where I first got to know him, and we just liked each other. And we both loved music, and that's the only thing we wanted to talk about and think about." Jennings became Holly's bass player and toured the country with him. It was Jennings who gave up his seat to the Big Bopper on the plane that crashed, killing everyone aboard -- including Holly. "We had been on a school bus because a couple of days before, it had been about 40 below, and our regular bus froze up," Jennings said. "Anyway, the Big Bopper had the flu, and he came to me and says, 'I hear you have a plane tonight. Is there any way I can talk you into letting me have your seat on that plane?' And I said, 'If you talk to Buddy and if it's okay with him, it's okay with me.' "
The next day, Jennings' guitarist told him about the plane crash. "That was my first experience dealing with death with someone that was close to me," Jennings said. "It took me quite a while to get over it." Jennings took several years off from the recording industry, but continued working in radio. In 1965, he moved to Nashville, where he met Willie Nelson. A decade later, Nelson and Jennings would team up on their compilation album Wanted: The Outlaws, which became a platinum record. In 1978, Nelson and Jennings released their biggest hit, "Mamas Don't Let Your Babies Grow Up to Be Cowboys." Being an outlaw was a rewarding experience. Jennings had 16 No. 1 singles and several gold and platinum albums. In 1975, he was named the Country Music Association's Male Vocalist of the Year and was later elected to the Country Music Hall of Fame. Jennings joined Gross in 1996 to discuss his autobiography Waylon, his collaborations with Nelson and his career in Nashville. He died in 2002 of complications from diabetes.